Amazon delivery drone problems: Birds will attack. This hawk isn’t a fan of Amazon’s drone delivery service. Konstantin Kakaes had a lot of good evidence to work with for his article debunking the promise of Amazon’s drone deliveries. The FAA doesn’t allow autonomous flight. Drones are too small and unreliable. They’ll cost Amazon a fortune to maintain and oversee. Kakaes had so many facts in his favor, but he left out a big one: Birds are going to hate these drones. Birds already cause a lot of problems for other things in the airspace. The FAA has tracked more than 121,000 instances of bird-aircraft collisions since 1990. These are accidental; the birds—most frequently gulls or pigeons, or in the case of the plane that landed on the Hudson River, Canada geese—are spooked off a runway during takeoff or landing. The difference for Amazon’s drones is that the birds will be chasing them. Unseen to us, the skies are checkered with fiercely defended bird territories. 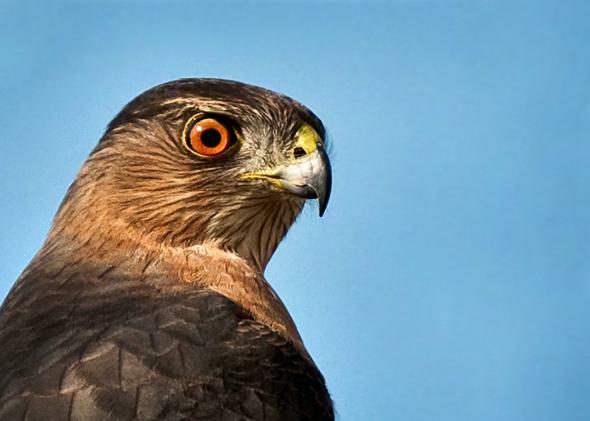 Open-country raptors—hawks, eagles, kites, harriers, etc.—don’t take kindly to interlopers on their hunting grounds, and frequently chase, dive-bomb, and take talons to intruders. The confrontations can be even more violent during nesting season when vulnerable chicks are potential prey. Smaller birds also bravely shoo away potential threats, including raptors. Kingbirds are most famous for this behavior and can sometimes be seen riding the backs of much larger birds, escorting them out of the area. It’s impressive behavior when seen from below—an aerial David and Goliath—and it’s common among open-country species, either solo or in pairs, like the kingbirds, or in huge flocks. Check out this peregrine falcon destroying an RC drone. Here’s some great onboard footage of a hawk attack. Skip to 2:10 for insane close-up and slo-mo footage of an Australian raptor (maybe wedge-tailed eagle?) ripping the front off a glider. Smaller birds get in on the action, too, like this flock of swallows harassing a drone helicopter, and a (European) magpie and hooded crow chasing planes. So add “environmental mayhem” to the list of things the FAA needs to consider before developing rules for Amazon’s drone delivery, or else be prepared to receive books scarred by talon swipes and beak pecks. It’s almost enough to make you pine for the days of waiting in line at the post office.